Unless you specify otherwise, Time Machine backs up everything on your Mac to which your account has access except temporary files, such as your web browser’s cache. 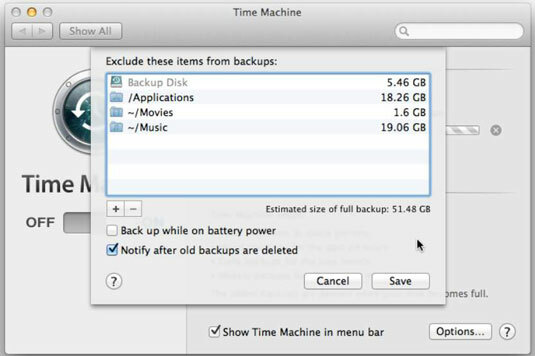 To save space, you can identify certain files and folders you’re not concerned about losing that you want Time Machine to ignore. For example, you may not want to back up your Applications folder if you already have all your applications stored on separate installation discs or you purchased them through the App Store, which lets you download them again if necessary. Or you may choose to skip backing up media you purchased and downloaded from iTunes because if you lose them you can download them again, so there’s no need to waste that precious space on your Mac’s backup drive. 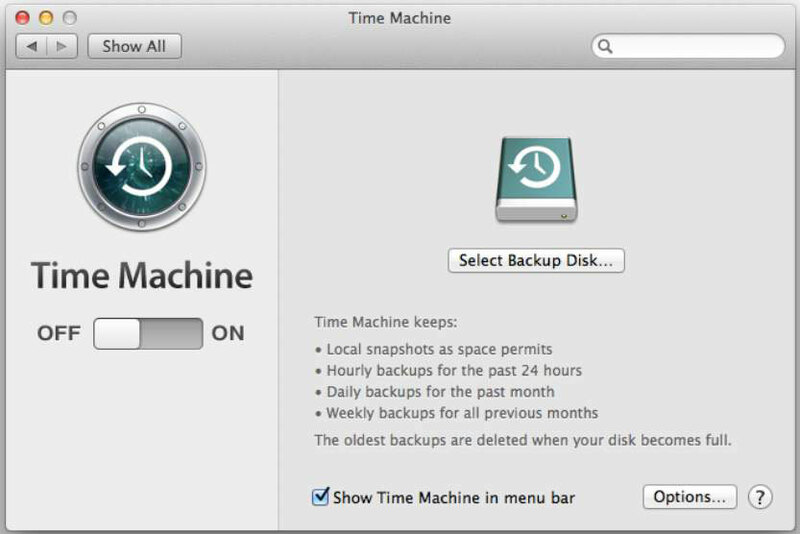 Choose Command→System Preferences and then click the Time Machine icon to open the Time Machine preferences pane, as shown in the figure. Click the Options button to open the Exclude These Items from Backups dialog. Click the plus sign (+) and then navigate through the mini-Finder window to the file or folder you want Time Machine to ignore. You can select multiple drives, files, and folders by holding down the Command key and then clicking what you want Time Machine to ignore. The Exclude These Items from Backups dialog appears again, as shown in this figure. Your backup disk appears first in the list. Next to each excluded item, you see the amount of storage it would occupy if you backed it up; below the list, you see the estimated size of your backup. Back Up While on Battery Power: This option allows Time Machine to back up your MacBook when it’s running on battery power. Turning on this option will drain your MacBook’s battery faster. Notify After Old Backups Are Deleted: Time Machine displays a dialog requesting your approval before it deletes any old backup files. Click the Time Machine On button, if it’s not clicked already.